Once the US Embassy in Manila approved you for US Visa, you have the two options on how you can receive it. You have the option for Home Delivery or Pick Up. The delivery time normally takes within 3-5 business days within Manila areas but if it’s in Provincial areas it can take up within 1 to 2 weeks. For 2go, you only need to provide your passport number or your MNL case number. It will keep saying “invalid” until 2go receives the visa from the US Embassy. 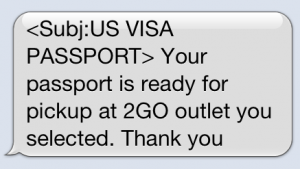 i RECEIVED A TEXT MESSAGE FRO 2GO EXPRESS THAT MAY US VISA APPLICATION IS PUT ON HOLD DUE TO IRREGULARITIES CONCERN. 6. PHOTO COPY OF MY RECEIPT NUMBER. I PUT IT INSIDE A SHORT BROWN ENVELOPE, THE ATTENDANT AT 2GO DID’T EVEN SEALED MY BROWN ENVELOPED. I received a text message from 2go yesterday but my visa wasn’t delivered yet and upon tracking it on their website it says invalid. Please help. Our visa has been approved already and current status is now Issued with created date Nov 22, 2018 and Last updated Date Nov 27, 2018. As of this writing, we still don’t have any update on when the visa will be transferred to 2Go for delivery. I would just like to know where or what branch of 2Go does the US Embassy first sends all the passport and the visa packets for distribution or delivery to your preferred location. Thank you!